The DM-LINER® allows a digital transfer of metallizations onto paper and cardboard stock. 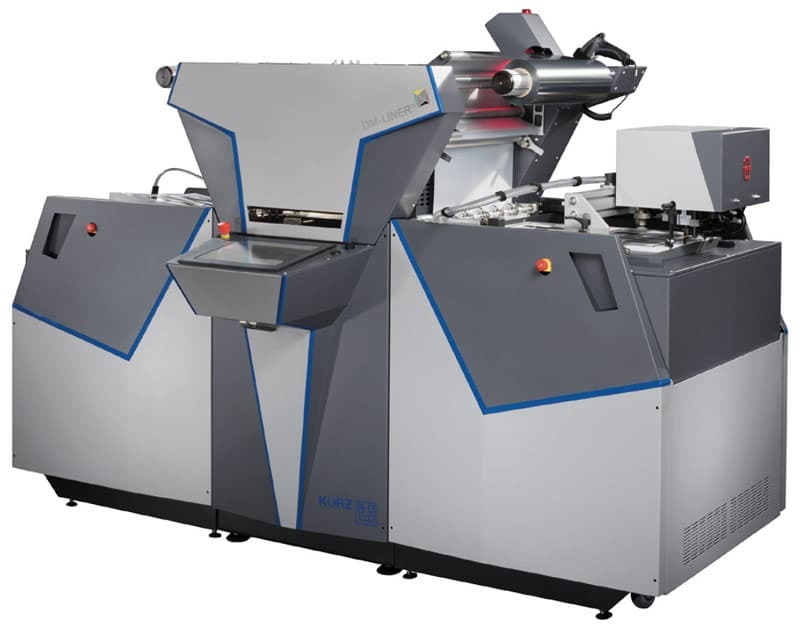 The transfer process is upstream of the digital color printing. The designs to be metallized are first printed with toner or electro-ink; then, the DIGITAL METAL® foil is transferred by the DM-LINER® and the PET carrier is removed. For processing, the DM-LINER® can be supplied by sheets as well as rolls. The addition of an unstacker and stacker allows the basic machine to be used for digital sheet-fed printing. The specified design is printed directly onto the substrate with toner or electro-ink. The foil is applied onto the preprinted material. After detaching carrier film, the metallized coating layers remain on the toner/electro-ink. Overprinting in digital or offset printing. Flawless enhancement results without deformation of substrate. Go to the DIGITAL METAL® website. Speed: 5 – 30 m/min.